I was so elated last Tuesday when I saw my South Korean tourist visa attached to my new passport. Although I wasn’t totally worried that I will be denied, that feeling of uncertainty really lingered on that day and right up to the releasing section when I queued and one by one, the priority numbers were called out and the passports returned. Ah, South Korea. I didn’t expect to visit this country this year as I had other plans but an invitation to exhibit my photography work, The New Cathedrals, made me change my plans. Is getting a South Korean tourist visa easy for Filipinos? If you have a sponsor, the letter of invitation should be in this format. It’s not available online. 1. Application Form – you have to download this from their site. The link is readily available. You can also get the form at the embassy or consulate and fill it out there. Please strictly follow instructions. They also provide paste and staplers and pens but better bring your own pen. 8. Original Personal Bank Certificate – must include account type, current balance, account opening date, ADB. Tell the bank what you need and they will generate the certification. In BPI, they charge P100 for this. As I have a sponsor, I got to know of the invitation form when I submitted in Cebu. I had to ask my sponsor again to make a letter of invitation in the form the consulate gave me. Check above. On bank accounts. This is contentious and the embassy or the consulate really doesn’t tell you how much you should have. A simple guide: know at least the average daily budget if your traveling to South Korea and multiply that to the number of days you are there. That should be your minimum amount at the bank. Submission and release is very straightforward and quick. I was told, however, that at the embassy, be early. Even before it opens, people already list up so that they can go in and finish early. It opens at 0830H and I was there as early as 0630H. I was fourth in line already. Yes, no need if you’re considered a frequent traveler, esp, to OECD countries. Hello, I have seen the invitation letter format you posted above. Is it the same format for applicants personally invited by a Korean? Thank you. Hello Mary, yes, I think so. steph, its in the post. Is the consulate still accepting visa application? Im from Davao City can I apply in Cebu instead? Hi! How long was the passport claimed on the claimig date? Did it take a while? My claiming date is actually on the day my flight is scheduled. 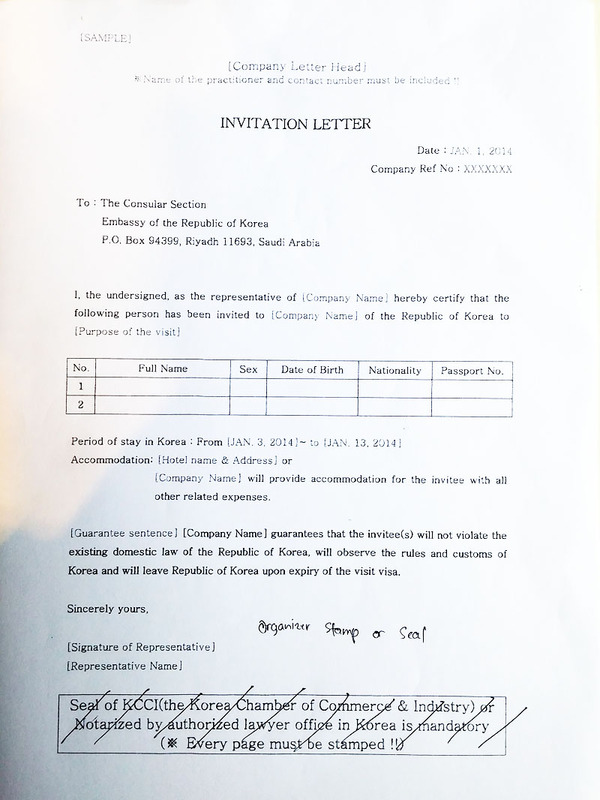 Korean consulate in Cebu changed 5 days to 7 days visa processing. If you’ve been denied in Manila. Can you still apply in Cebu? If you’re denied at either, I think there’s a minimum number of months before you can apply. But just please check. Can one person process the visa for 5 person? Myra, please check the post, its there. It was just given to me and was told to follow the format. I have something to ask if what are the requirements needed for korean tourist visa. ?because My employer is korean and wants me to go on vacation with her for 1or 2 mons.. But i don’t a bank account and itr ..how can i make visa in this situation sir? Can i only get that form through a Korea citizen! ?